This session will showcase numerous cyber-enabled crime use cases. You will gain an understanding of many of the common attack methods and where in the cyber kill chain financial institutions are most vulnerable. Robert Goldfinger is a global expert of financial crimes solutions for BAE Systems Applied Intelligence. Goldfinger has nearly three decades of leadership experience in both the public and private sectors. This experience includes leadership roles at technology companies, a financial institution and a government agency. He brings a unique combination of management expertise and operational and investigation leadership across business environments requiring both technology and investigative solutions. Lukayn Hunsicker is the global head of banking fraud product management for BAE Systems Applied Intelligence. Hunsicker serves as a subject-matter expert in the areas of financial crime and fraud, delivering and maintaining fraud prevention solutions for BAE Systems’ diverse customer base. He has more than 15 years of experience in the financial services and software industries. 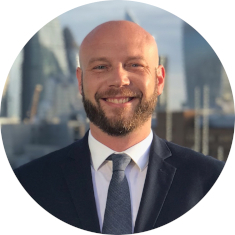 Prior to joining BAE Systems in 2016 he was vice president, fraud product management for a top-tier global processor where he oversaw multiple product lines related to fraud and risk management. In addition, he has held product consulting roles pertaining to cybersecurity, risk and insurance.